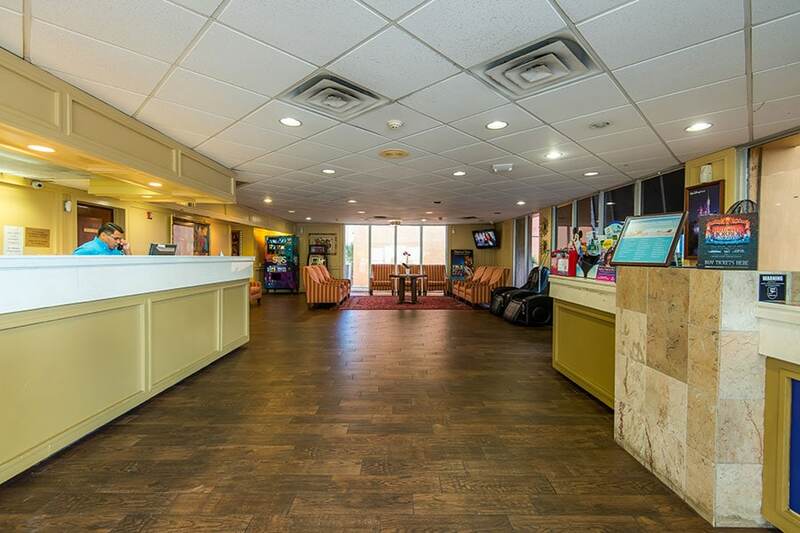 It's time to get your unforgettable Orlando vacation started off right by selecting the Floridian Express Hotel. 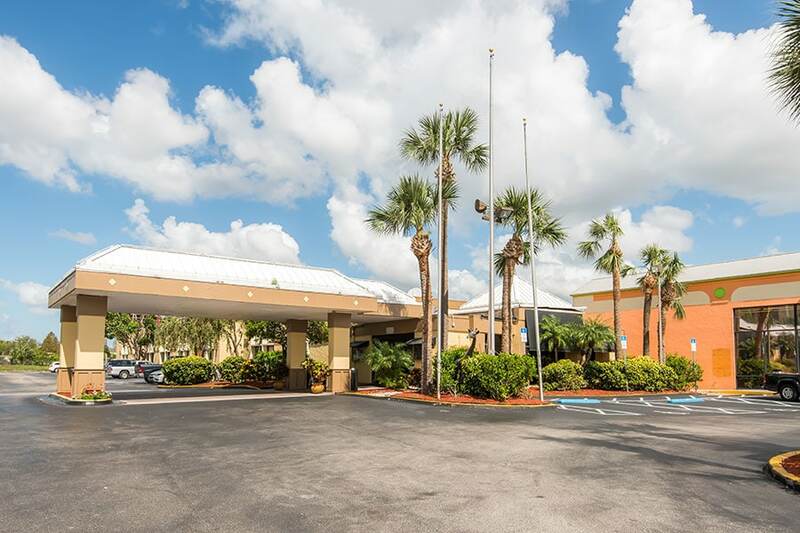 Ideally located on International Drive, just minutes from world class entertainment and attractions, plus an abundance of dining and shopping, provides an endless array of choices. 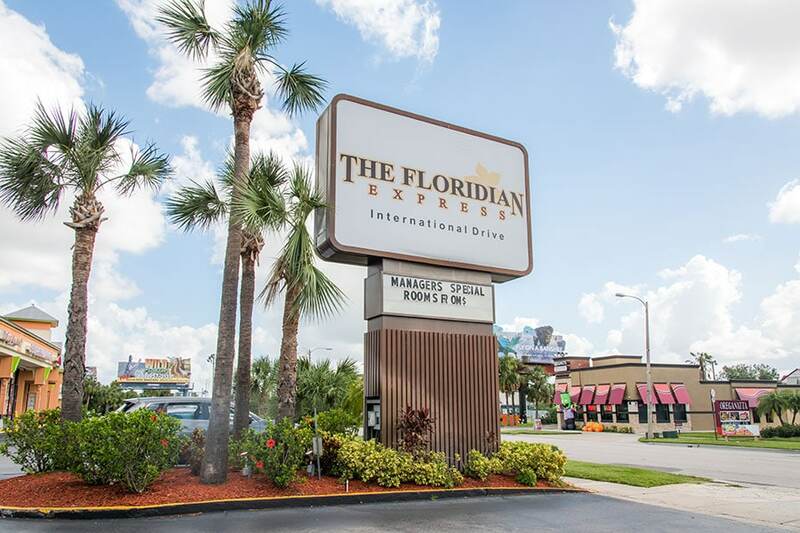 Look to Floridian Express Hotel for a range of well-appointed rooms, hotel amenities and services for a perfect blend of convenience, value and comfort. An experienced front desk staff is available 24 hours a day to welcome and assist you. Various spacious room configurations set in a warm and inviting decor await. Consider pool side rooms with direct access to the swimming pool or rooms with ADA accessible features. 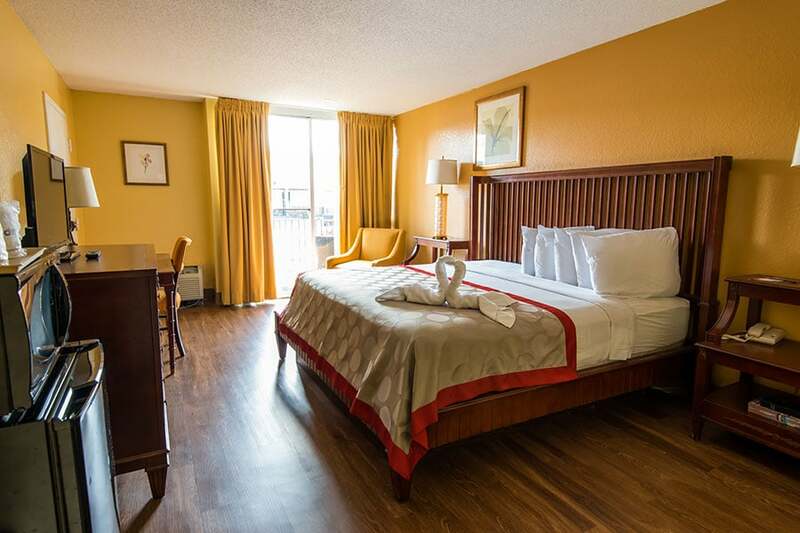 Guests will enjoy the comforts of home with room amenities including flat screen, premium package cable TV, free high-speed Wi-Fi, refrigerator, microwave, and ironing facilities. Get a morning start with free breakfast buffet. Leave the vehicle behind with free parking and catch a complimentary shuttle from the hotel to the major theme parks. If you're taking a break from the action, the Floridian Express Hotel provides a relaxing swimming pool, separate kiddie pool plus a game zone arcade. Orlando is a premier vacation destination and the property is situated right in the middle of it all. Within an easy two mile range, you'll encounter Universal Studios Orlando, SEA LIFE Orlando Aquarium, I_Drive-360 and Fun Spot America Theme Park to name a few. A little farther drive get you Walt Disney World, SeaWorld, Disney Animal Kingdom, Epcot Center, ESPN Wide World of Sports Complex, and Disney Hollywood studios to name a few. Want a break from the mainstay attractions? Wonderworks Orlando, Pirate's Cove Adventure Golf and Ripley’s Believe It or Not, the Titanic: The Artifact Exhibition, and The Escape game Orlando are some alternative just down the way. Switch gears from the thrill rides and theme attractions and ponder a different day adventure to the Orlando Science Center or for the stargazer in the family, perhaps a drive to Cape Canaveral for a visit to the Kennedy Space Center fits the bill. 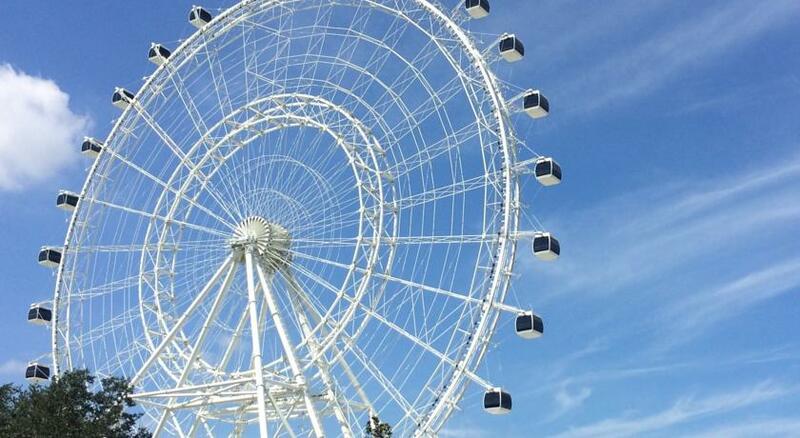 One of the newest attractions in Orlando with the largest observation wheel on the East Coast! Don't miss the new Madame Tussauds, the world's most famous celebrity wax attraction, and SEA LIFE Orlando Aquarium. Located in the heart of International Drive. Universal's Volcano Bay™ – NEW! Live the carefree island life at Universal's Volcano Bay™. It's an all-new water theme park like no other where thrills and relaxation flow in perfect harmony. With the power of the TapuTapu™ wearable there's no standing in long lines, wrestling with tubes, or waiting for the fun to begin. It's a tropical paradise just steps away from everything Universal Orlando Resort™ has to offer. Immerses guests in a mystical world of massive floating mountains, bioluminescent rainforests and breathtaking new experiences. Here guests explore an awesome alien landscape, encounter a larger-than-life Na'vi shaman and soar over Pandora on the back of a fearsome mountain banshee. There is no lack of dining options in Orlando. In addition to the many themed restaurant at the major attractions, the Floridian Express Hotel on International Drive and near Sand Lake Rd. is surrounded by over 50 restaurants and food chains catering to any budget and taste. For something different, consider Orlando, City Center offering extensive fine dining to sumptuous local cuisine with numerous, moderately and budget priced venue options. There are plenty of recommendations; just search top 10 dining spots in Orlando for listings and write ups. 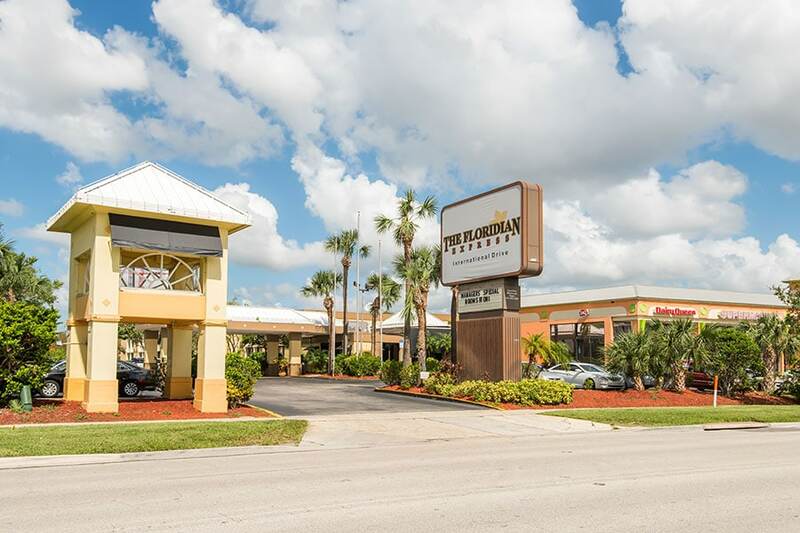 The Floridian Express Hotel is less than one mile from two shopping outlet centers. Pointe Orlando which provides an outdoor, pedestrian-friendly mall with a safe and fun atmosphere and the Orlando International Premium Outlets is another choice. A bit farther away The Mall at Millenia is a go to spot for many designer shops and the Florida Mall provides an upscale, open-air shopping center. Orlando proudly bears the name "The City Beautiful" in part due to all the parks and recreation sprinkled throughout the city. With varied activities such as kayaking, paddleboard tours, horseback riding, zip lining or just pulling up a chair at an outdoor venue listening to live music, there is plenty to do to satisfy outdoor enthusiast. Orlando is home both NBA and Major League Soccer (MLS) franchises so get the sporting urge and catch an Orlando Magic game at the Amway Center or watch the Orlando City SC soccer team playing out of Camping World Stadium. Orlando offers a vibrant nightlife and a wealth entertainment options. Come back to the Floridian Express Hotel, get refreshed and venture back out to Universal Orlando and experience Universal City Walk. Dubbed as Universal Orlando's 'entertainment hotspot', featuring many bars, restaurants and shows open well past midnight. At Downtown Disney, the House of Blues books top talent features on an impressive huge interior and main stage. The Orlando city center is home to the Wall Street Plaza having a reputation for offering a more 'local' experience with a mix of laid back restaurant, bars and clubs with seven venues while the lively downtown area around Lake Eola may fit the bill. Check out the Beacham and Ono Clubs. The Orange County Convention Center (OCCC) is the primary public convention center for the Central Florida region. The center currently ranks as the second largest convention center in the United States (the first is McCormick Place in Chicago). The OCCC offers 7,000,000 sq ft (650,000 m2) of total space 2,100,000 sq ft (200,000 m2) of which is exhibit space. The large complex is located on the south end of International Drive, a major tourist area in Orlando, Florida. Solar panels on the roof of the South Concourse provide 1 MW of power. On April 18, 2012 the American Institute of Architects's Florida Chapter placed the building on its list of Florida Architecture. The game puts the player in the position of managing SeaWorld parks from a 2.5D (isometric) perspective. (The San Diego, San Antonio, and Orlando parks). It features two different modes of play. One is a mode where the player must complete certain tasks in the park (often pre-built) before moving on. The second is a sandbox mode where the player starts building their own park out of the given barren land and a certain budget. In this mode, there are no limitations to what a player can and cannot do within the park grounds. All children are welcome. Free! All children or adults stay free of charge when using existing beds. Free! One child under 2 years stays free of charge in a crib. The maximum number of extra beds/cribs in a room is 1. Any type of extra bed or crib is upon request and needs to be confirmed by management. Additional fees are not calculated automatically in the total cost and will have to be paid for separately during your stay. The hotel has a restriction policy about Orange county and Osceola county residents. Please call hotel regarding the policy. This hotel charges a resort fee of $5.95 per room per night. It was a very decent hotel for the price. I liked it very much that I stayed an extra 2 days. The pool was awesome nice and warm and clean. The room was great clean and comfortable bed and pillows. Breakfast was waffles, toast, cereal coffee and orange juice but was good enough for us nothing out of the ordinary. The location is AWESOME!!!! Right on international drive down the street from wet and wild not far from the theme park and close to the prime outlets. Great travels!!! It was very reasonable considering that the area is a high tourist area. It was very affordable and worth every penny of the cost. Location is excellent close to everything on International drive and very close to universal. if you are looking for a cheap place to stay I would recommend this one. The rooms are clean and the staff are very nice, the pool area is VERY nice. Location is excellent close to everything on International drive and very close to universal. if you are looking for a cheap place to stay I would recommend this one. We go here twice a year the place in a great location. Hotel is not bad love the pool area. The pool view was amazing,i enjoyed my stay.